We’ll start with the obvious…there’s tons of space! When you stay in our 13 bedroom cabins in Gatlinburg TN, you’ll have enough bedrooms to comfortably sleep up to 60 people! Everyone will have plenty of privacy, and the living room is large enough for everyone to gather together to enjoy good conversation and catching up! The hot tub is often the most exciting and popular part of our cabins. They’re the perfect place to soak away the stress of real life or unwind after a long day of hiking, shopping and exploring the city. When you’ve got a large group of people, 1 hot tub is simply not enough, which is why our 13 bedroom cabins in Gatlinburg TN have 2! There’s no better way to enjoy relaxing with a large group than by laying back and watching a favorite movie. 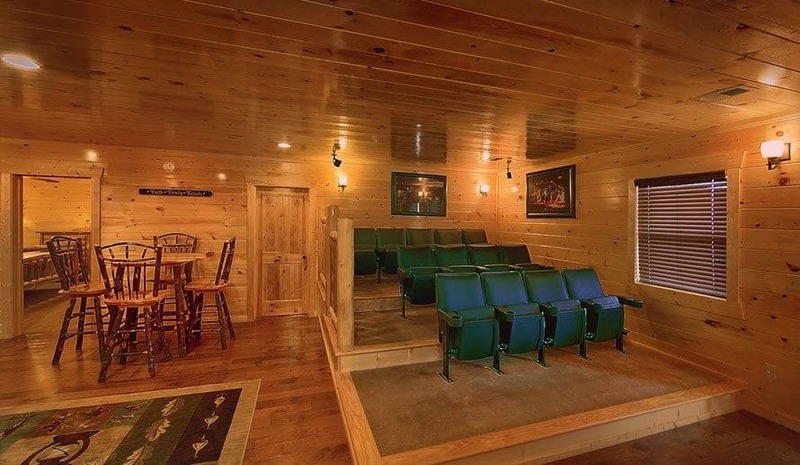 Our cabins boast modern theater rooms with extra comfy seating and a giant movie screen. You’ll forget you’re still in the comfort of your cabin! One of the more expensive aspects of any vacation is food costs, and trying to get restaurant accommodations for a large group can be nearly impossible. You’ll save lots of money and a bit of stress when you gather in your cabin’s kitchen and cook meals as a group! It’s a fun way to bond, and it’s a lot more efficient than trying to eat out for every meal. To save even more money, check out how to get the best deal possible with our money saving calculator! Another way to keep your group entertained in our 13 bedroom cabins in Gatlinburg TN is to send them downstairs to the game room for hours of gaming fun! With group games such as pool tables, air hockey and foosball, you might have a hard time getting everyone away from the games and back upstairs! When your group has been cooped up long enough, you’ll only be a short drive away from dozens of Gatlinburg TN area attractions. Whether you spend the day riding the rides and watching the shows at Dollywood or learning about aquatic life at Ripley’s Aquarium of the Smokies, your group will have a blast in Gatlinburg TN! During the warm months of May-September, your group will have access to our luxury outdoor pool and pavilion! Splashing around in the pool and grilling out under the pavilion is the perfect way to spend a summer vacation in the mountains. And when it’s chilly outside, your group will love our cabin Splash Mountain’s indoor pool! Swimming is a year-round activity when you stay with us! Now that you’re convinced that our 13 bedroom cabins in Gatlinburg TN are the perfect place for your large group vacation, don’t hesitate to book your stay today! September Promotion: Once-in-a-Lifetime Smoky Mountain GiveawayWhy Should You Stay in 5 Bedroom Cabins in Pigeon Forge?